Nissan made some waves last month when they announced the Nissan Versa 1.6S, a car that would cost only $9,990 and snagged the unofficial title of "cheapest car in America" from Hyundai. The Korean automaker has struck back by dropping the price of their Hyundai Accent GS 3-door from $11,070 to $9,970, besting the Versa by an Andrew Jackson. That money will get you the same 1.6-liter, 110-horsepower engine and five-speed manual transmission found in the regular version. You'll also still get no radio, no air-conditioning and steel wheels. What's the catch? All the other prices remain the same, meaning that if you want a 3-door with an automatic you'll pay a whopping $2,100 premium for the pleasure of having the car choose the gears for you. If you want air-conditioning prepare to pay another $1,600. Full details in the press release below. Hyundai Accent Retains Crown as America's Least Expensive Car FOUNTAIN VALLEY, Calif., Nov 25, 2008 /PRNewswire via COMTEX/ — The country's most dependable sub-compact car is also its most affordable. The high-mileage 2009 Hyundai Accent has a starting price of $9,970, making it the least expensive new car on the market. But it's also the "Most Dependable Sub-Compact Car" available (as determined by the J.D. Power and Associates Vehicle Dependability Study(SM)) and one of the most fuel efficient vehicles on the road today — a trifecta that no other car can match. "Accent is the perfect vehicle for a customer looking for the ideal mix of price, dependability and fuel economy," said Mark Dipko, Small Car product manager. "And as a brand known the world over for its value, we feel it is important to retain our crown as the most affordable new car available." At the Los Angeles Auto Show, Hyundai announced even more good news for the Accent, revealing that next year a special high-mileage "Blue" edition will be available that offers even higher levels of fuel economy without adding to the price. Accent "Blue" will feature fuel-efficient modifications to reduce engine friction and rolling resistance, enhance aerodynamics, optimize gearing and revise engine calibrations for maximum efficiency, all adding up to higher fuel mileage and lower emissions than today's model. The 2009 Accent GS retains the same content as last year's model and has not been reduced to achieve America's best price point. Accent GS offers a 1.6-litre, 110-horsepower engine, power steering, advanced front airbags, front seat-mounted side-impact airbags, roof-mounted curtain airbags, tire pressure monitoring system, front variable intermittent wipers, 60/40 split fold-down seatback, six-way adjustable driver seat, adjustable head restraints for all seating positions and rear spoiler. Pricing for all other Accent models remains unchanged, delivering outstanding value throughout the lineup. In addition to the $9,970 Accent GS 3-door with manual transmission, the Accent three-door with automatic transmission starts at $12,070; Accent GLS 4-door with manual transmission starts at $12,920; and the sport-tuned and comprehensively equipped Accent SE 3-door with manual transmission starts at $15,070. Freight charges for Accent are $695. All Hyundai vehicles sold in the U.S. are covered by The Hyundai Advantage, America's Best Warranty. Hyundai buyers are protected by a 10-year/100,000-mile power train warranty, a 5-year/60,000-mile bumper-to-bumper warranty, a 7-year/unlimited-mile anti-perforation warranty and 5-year/unlimited-mile roadside assistance protection. Hyundai Motor America, headquartered in Fountain Valley, Calif. is a subsidiary of Hyundai Motor Company of Korea. Hyundai vehicles are distributed throughout the United States by Hyundai Motor America and are sold and serviced by more than 790 Hyundai dealerships nationwide. 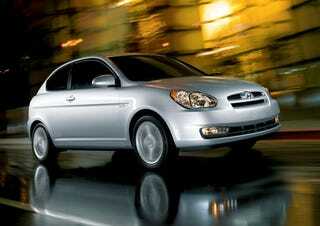 Hyundai Accent received the lowest number of problems per 100 vehicles among sub-compact cars in the proprietary J.D. Power and Associates 2008 Vehicle Dependability Study(SM). Study based on responses from over 52,000 original owners of 2005 model-year vehicles, measuring more than 250 models. Proprietary study results are based on experiences and perceptions of owners surveyed in January to April 2008. Your experiences may vary. Visit jdpower.com.